Mom Faces Backlash For Son’s Punishment – What Do You Think? There are so many negative influences in the world right now that it becomes hard for parents to know how to respond sometimes. We do our best to guide our children to treat others with respect and teach them how to handle themselves in situations they may face when we are not around. One mom, however, received a flood of comments online for how she decided to discipline her son recently – and she may have done more harm than good. She wanted to show her son that there would be zero tolerance for this kind of treatment of others, so she came up with a unique method of discipline. 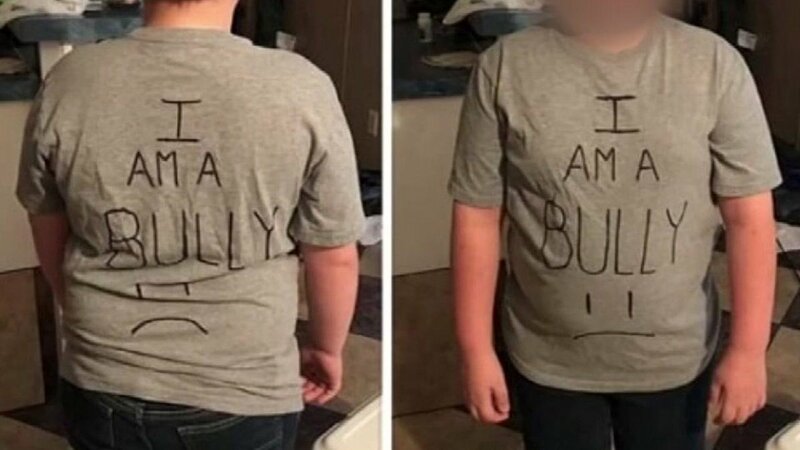 She made him a t-shirt that said, “I am a bully,” and forced him to wear it to school the next day. Star removed the post after the online comments became overwhelming and divisive, but she stands by her decision as a parent, saying even administrators at her son’s school supported the idea. “Ensuring a safe physical emotional and social environment is one of the Splendora ISD’s core principles. With that in mind our counselor checked on the child throughout the day on Friday and plans to follow up with the student and parent early this week,” said a school spokesman according to ABC 10. But while some parents responded positively to Star’s social media post, most agreed that “giving the child a taste of his own medicine” was not the most appropriate response. One family counselor responding to the story stated that embarrassing a child, especially publicly, could just serve to further the negative behavior that he was exhibiting in the first place. Mommy Underground previously reported on this very issue and the damage that using public embarrassment as a form of punishment can cause a child. Children depend on the trust relationship they have with their parents, and public ridicule is likely to backfire – not just in the current behavioral situation, but in the way he responds to negativity in the future. Kids Health states that kids who bully need help from trusted caregivers to learn how to appropriately manage their anger, hurt, and frustration. They must learn the skills necessary to cope with negative situations they will inevitably face in life. Publicly embarrassing a child, especially in a large forum such as social media, will only make them withdraw and lose trust in those who are supposed to help him. Just imagine how this boy must be feeling after seeing his picture and the story of his behavior plastered all over the internet and even on national news outlets. Kids learn to treat others the way they are treated. In this case, this child may look to belittling and embarrassing those who make him feel threatened. Respect is taught, and this mom doesn’t seem to have much respect for her child’s feelings – the root causes of the name-calling and the aftermath of emotions caused by such public attention. So how do we stop our kids from becoming bullies? Kids Health has some suggestions that all parents should take to heart. In all cases, we must make sure our kids understand that bullying in any form is unacceptable and should be taken very seriously. If left unaddressed, smaller issues like name-calling can turn into very dangerous confrontations as kids get older. Parents, with the help of a counselor if needed, must work with the child to understand where these negative feelings come from. Are they being bullied by someone themselves? Is the family going through a tough situation like a move or divorce? Any significant change in behavior must be addressed immediately with open and honest communication between parent and child. Make sure you talk to your kids about what they do each day, who their friends are, or any situation that made them upset and has not been resolved. Be open and available. Be supportive and encouraging, and work together to address the issue at hand. Encourage good behavior and model it yourself! Parents are a child’s first, and most important, role model. They pick up on everything, and they will mimic our negative behaviors because they are watching those they look to for guidance. After all, if Mom and Dad do it, it must be ok, right? Set a good example by treating others with respect and focusing on the positive. When our children see how we react to conflict, they are learning the skill of conflict resolution. And if we behave aggressively or are disrespectful when we are frustrated, angry, or hurt, this is likely how our children will react in similar situations. The Golden Rule is good to remember here: Do unto others as you would have them do unto you. We doubt this mother would want to be publicly humiliated for a bad decision all over social media and the news. So why does she think it will help her son? What do you think of this mom’s punishment for her son’s bullying? Do you agree with the experts, or do you think she did the right thing? Leave us your thoughts.